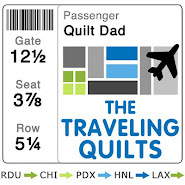 Quilt Dad: Doll Quilt Swap 8 | Manquilters unite! Doll Quilt Swap 8 | Manquilters unite! Another round of the popular Doll Quilt Swap has come to an end. Though I wasn't a "swap papa" this time around, I certainly didn't want to miss out on the fun. 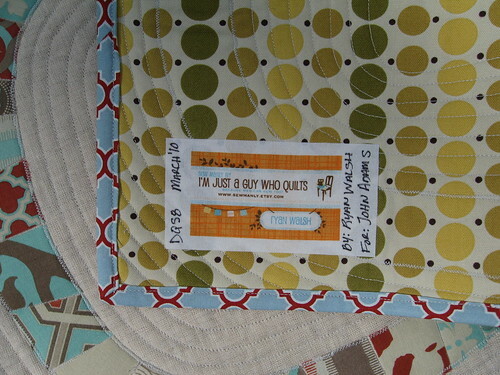 Here's the mini quilt I received from fellow guy-quilter Ryan (of ImJustAGuyWhoQuilts fame). Ryan has become a good friend of mine in the blog & Flickr worlds, so it was so nice to receive something that he had made. He knows my tastes -- and especially my love for all things Joel Dewberry -- quite well. I absolutely love his mini take on the Denyse Schmidt Single Girl pattern -- single girl for the married guy, I guess? And it matches the swap pillow I received a few months back! 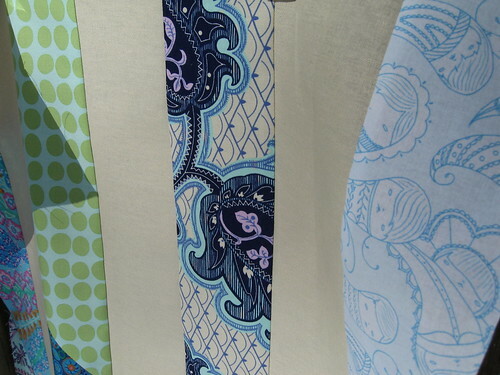 Ryan recently had some funky quilt labels made at Spoonflower -- pretty neat, eh? The label is shown here against the awesome County Fair backing. Thanks so much, Ryan -- I hope you know how much I love this little quilt! Our swap mama Kimmie apparently had some fun this round, because not only did she match Ryan to be my secret partner, but she paired me with the 3rd guy in the entire swap: Scott Hansen of Blue Nickel Studios! (And, to complete the chain, she had Scott send to Ryan ... so the three of us had our own little manquilter swap of sorts.) Oh Kimmie, you're too funny! I combined linen with an eclectic mix of prints in blues & greens for Scott, trying to match the aesthetic he seems to like. Mine turned out a bit more minimal than Scott's work, but I hope he likes it. If you can envision it, I embroidered "blue nickel studios" on those three linen bars. I am hoping that Scott will get some good pictures of the finished quilt. If so, I'll be sure to point you all there to see it! Super cool minis all around!! I hope next time Kimmie lets you manquilters out to share your talents with the rest of us! 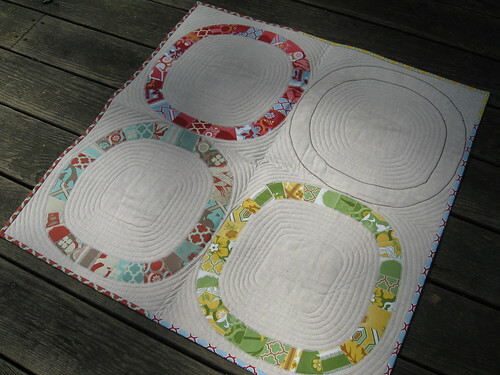 can't wait to see the final pictures of your quilt and the quilting. 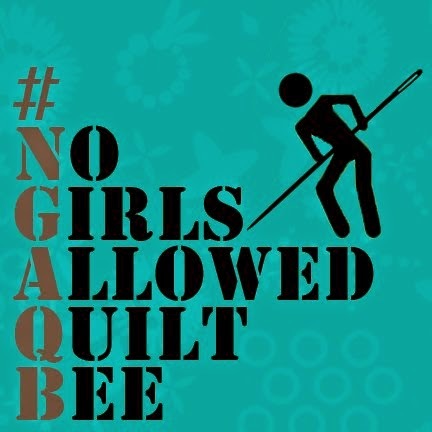 The quilt label idea is such a great use of Spoonflower. I am definitely going to be using that idea. Fun stuff! 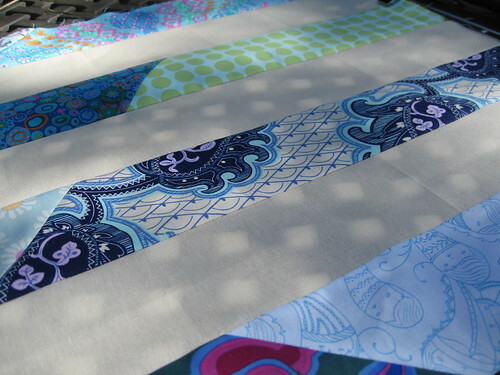 I'm so curious now to see your finished quilt for Scott. I've done it too, though. In a hurry to get it in the mail, no time for photos and sorry about it later! Keep us posted if he posts. Hey John! I see you used some of that spoonflower fabric in Scott's quilt. I keep forgetting I have some stashed. It's funny that you decided to embroider blue nickel studios on his quilt because the same thought happened through my mind when I was making yours. I wanted to embroider quilt dad in the upper right corner, but opted for the empty ring instead. Hope you find an awesome space for a studio in your new place. Take lots of pictures! You'd better (direct us to pics if posted by Scott)! I want to see it! Very cool, where did you get the blue fabric with the faces for your quit for scott? Just heard of you today at our first Cincinnati Modern Quilt Guild meeting! One of the ladies had made a few of your blocks and was raving about you. SO great to see your stuff and see what you're doing.